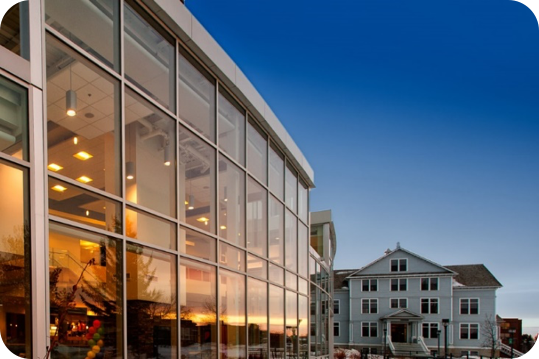 The Augustana Campus chemistry labs have traditionally been perfectly acceptable, but have yielded somewhat standard chemistry experiments with very typical analysis. As a satellite campus of the University of Alberta, located in Camrose, Alberta, we have strived to be almost an extension of our North Campus sibling, which has proved problematic within the constraints of a 100 kilometers distance. Recently, things have changed. Last summer, we diverged from this straightforward and customary path and decided to do something slightly different. 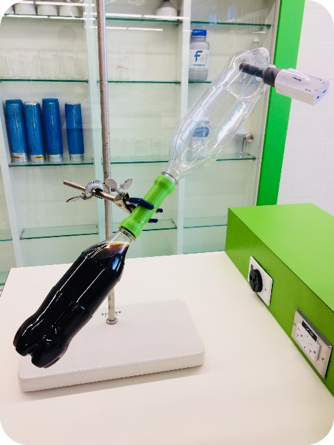 Along with our newly renovated labs - that encourage thought and collaboration - we have fundamentally changed our first-year chemistry lab experiments, which mean that different analyzation techniques are needed. Gone are vitamin C titrations with Tang and tablets, replaced by extraction techniques and spectral analysis. 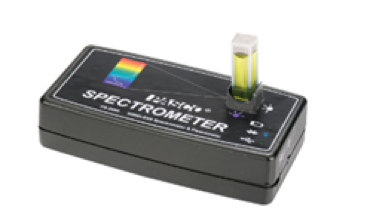 Hand-held spectroscopes have been replaced with a fiber optic cable in a light emissions lab while also adding a light measurement for chemiluminescence. 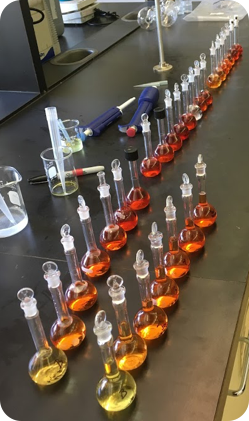 Our previous vitamin C laboratory experiment was based in a traditional vein, where titrations were used to determine the vitamin C content in both Tang (a powdered orange drink very few students today have ever experienced) and 500mg vitamin C tablets. Being a “traditional” lab exercise meant that most students likely had seen this done in high school or had done this very titration themselves. Our goal was to create an experience where the students learn a new analytical technique by extracting vitamin C from a pepper, then determining the vitamin C concentration from a standard calibration curve on a PASCO Wireless Spectrometer. All of these skills are taught in the first week of this exercise. Week two is all about the inquisitive nature and enthusiasm of the first-year chemistry students. We wanted them to start critically thinking about what they read and whether or not it is scientifically sound, and we also wanted students to gain confidence in their research abilities right away, both in a laboratory setting and with data analysis. The idea is that students would formulate a research question and then create a hypothesis to test in the lab to add to their skills. Since the PASCO Wireless Spectrometer allow us to keep data sets, we could use the same calibration curves throughout the testing. Light emissions lab experiments can be tedious at best. You need to constantly be looking through a hand-held spectroscope, which is exactly what we were asking our students to do. Also, we were looking at lights, flame tests and emission tubes with said spectroscopes. Throughout all of this, we weren’t asking the students to really do anything else, chemically speaking. 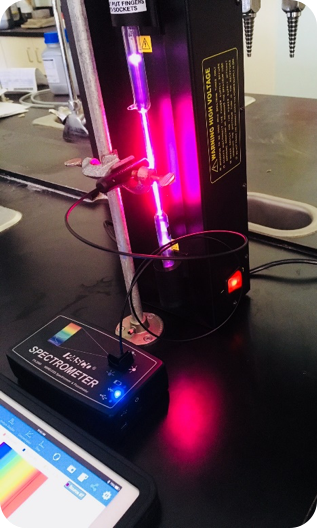 Chemiluminescence and chromatography columns were two things we decided to add into our updated labs, along with the fiber optic cable accessory for the Wireless Spectrometers (as well as scaling back the spectroscope use). 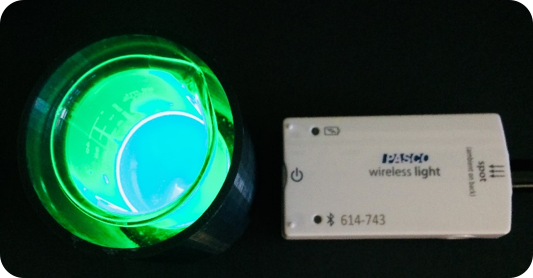 In the first part of our experiment, students would activate a glow stick and add the content to our 3D printed Light Calorimeter, then read the light emitted using the PASCO Wireless Light Sensor. From here, students would take the glow stick content and run it through a silica gel column to remove the chemical that activates the “glow”, then read the light emitted again. Peroxide and sodium salicylate would then be added to get the “glow” to return, and one last reading on SPARKvue would be taken. By using this method, we wanted students to learn not only about columns and their ability to separate mixtures but also to get comfortable learning how to collect data using a sensor and a data logger (in this case an iPad). In the second part of our experiment, we still use traditional light emission tubes (Argon, Helium, etc.) where we use spectroscopes to obtain the emission spectrum lines. For the hydrogen tube, however, we set up the fiber optic cable accessory and the PASCO Wireless Spectrometer to get the most precise emission light spectrum we can. Ideally, the students learn both techniques but come away with the appreciation for the newer tech. Changing these two experiments to incorporate PASCO equipment and using different techniques has allowed the students to get a more modern feel for newer types of equipment and techniques that are more advanced than your “standard chemistry type” experiments. 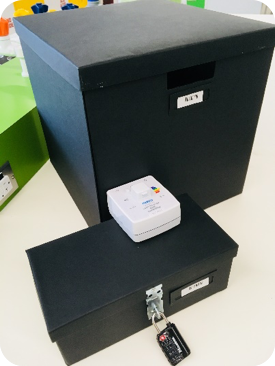 Since the wireless sensors are easily incorporated into our lab designs, we have set our sights on adding the brand new PASCO Wireless Colorimeter to our forensic based Escape Box Lab to give students an idea how an analysis of this type could be performed in the field. We also have a unique laboratory based three-week course for non-science majors that utilizes the PASCO Wireless CO2 Sensor in an interesting way. Our laboratory future is both bright and innovative, and more importantly, possible, with the tools from PASCO at our disposal. This blog originally appeared on AYVA's website on July 4th 2018. AYVA is the exclusive partner of PASCO in Canada.